Halifax CITY Soccer Club was established in 2006 as the result of the merger between Halifax City Wanderers & Halifax Celtic Soccer Clubs. The Kingfisher is a long time symbol of peace and prosperity and is situated prominently in the centre of the shield located in the City of Halifax' Coat of Arms. 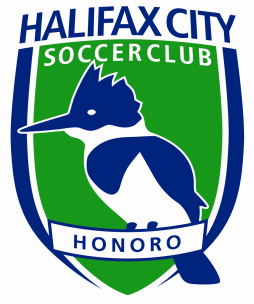 Our club crest heralds the Kingfisher as we are an urban Halifax soccer club. The club is distinctive in its green and white hooped jerseys. Halifax CITY Soccer Club pays homage to our heritage by keeping the dominant green colour associated with Halifax Wanderers and the traditional hoop jersey associated with the Celtic name. The Latin word Honoro is proudly displayed on our crest as a reminder to all members of our club to respect their teammates, coaches, opponents, officials, spectators, volunteers and the beautiful game itself. A very special thanks to Mark Gascoigne, Principal & Managing Director of Trampoline Branding Advertising Design who offered his professional services at no charge to Halifax CITY Soccer Club. Without Mark's expertise (& great patience!) our crest would not be as you see it today.